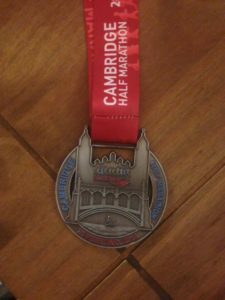 Very annoyingly I returned from El Medano with a sore achilles so as it was so close to the Cambridge half I decided to rest until the event on Feb 28th. Due to injury my friend Gina had already decided not to run but after much soul searching I decided to take a risk and run, so Gina decided to come along and cheer me on. I was very nervous on the morning of the run,wondering if i was doing the right thing but thought if i just took it steady I should be ok. The weather was perfect and the atmosphere amazing. Due to the huge amount of runners, around 7,000, the start was a slow one , which was not a bad thing. first part of the route took us through Town passing by many of the great city colleges, we then headed out to Grantchester which was more rural. Much to my surprise and delight I spotted people I knew in the crowds of spectators and this gave me a real boost. There was Four water stations on this run each included a gel option too, so I decided to take a gel at each station and I think this worked really well for me as I never got the usual tired feeling at around the 9/10 mile mark. By the time I was coming back into town I was happy and relaxed thinking i was going to get my P/B time, I heard Gina cheering me on and I thought I had cracked it but then at mile 11 disaster struck and i felt something “pop” in my lower leg, I stopped for a second thought bugger what shall I do now !! then decided that as i was so close to the finish I should just run/limp to the end. My time was 2.19 not bad since I had to limp home, it was by far the best running event I have ever done,the bling was awesome, and I don’t regret running it at all. This entry was posted in Half Marathon, Running on May 30, 2016 by Sally. Great post and so bad that you haven’t been able to run for so long 🙁 but at least you could bike..